Great crew, exceptional work, and we'll definitely give them more work soon. From the moment I met Ryan I took an immediate liking to him. He came to my home and we talked about removing my stone porch, which was shifting and about to fall. I had actually only wanted to have the wall rebuilt. Ryan suggested take the whole porch off, build a deck with sitting room under it and putting a door in so I could access my basement from outside which I have never been able to do in the 33 years that I have lived here. 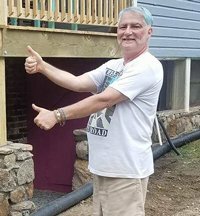 He also suggested building a half wall under the edge of the deck so the new work would blend well with the existing stonework foundation and offer a little privacy for the seating area under the deck. He quoted me what I consider a more than fair price having two other contractors wanting to charge me $10,000 more just to fix the leaning wall. Due to all the rain that we had late May and early June, it was hit and miss on whether work could progress or not, however, they did finish on time with everything I had hoped for and more. I have to give kudos to his work crews as well. They are all hard workers, friendly and polite and were fast and professional. I am very pleased with the job well done. It looks beautiful, is new and strong, added more value to my home than the work cost and will last longer than I will. Thank you Ryan and crew. I'll miss seeing you here. I would be happy to recommend you to anyone that asks. It turned out better than I had hoped for. You did all that we agreed to on the contract and more. Thank you! Thank you! Thank you! I was very impressed with Greenscapes Landscaping. Ryan the owner was very nice and went above and beyond to assure my satisfaction. He worked with me around my schedule and was flexible about my finishing touches. They started out doing my landscaping and I was very happy with the work and learned they do construction as well. He then put down new floors throughout my house and I was shocked at how great they look. I had gotten some quotes and Greenscapes were cheapest one and I am very happy I went with them. They were very fast and I love the results! I would definitely recommend them. Description of work: They built two retaining walls and completely landscaped my yard. They also remolded by house including putting in hardwood floors and tile throughout. Ryan was very conscientious on the details of the project. His employees were very courteous and hard workers!! Ryan delivered not only what was in the contract but went up and beyond in the materials used and the quality of of his workmanship was outstanding! Ryan's vision was right on the mark and the project turned out fantastic! I would highly recommend Greenscapes Landscaping and Retaining Walls for any project and would definitely use them again for any of our projects.